What Else Can I Expect From an Online Doctorate in Education Program? Many of today’s students are choosing to earn their doctorate in education online rather than in a classroom. Web-based studies follow the same rigorous curriculum as their brick-and-mortar counterparts, leading to the same number of job opportunities for graduates. The asynchronous schedule is perfect for students with careers, childcare duties, and other responsibilities that may interfere with campus-based learning. 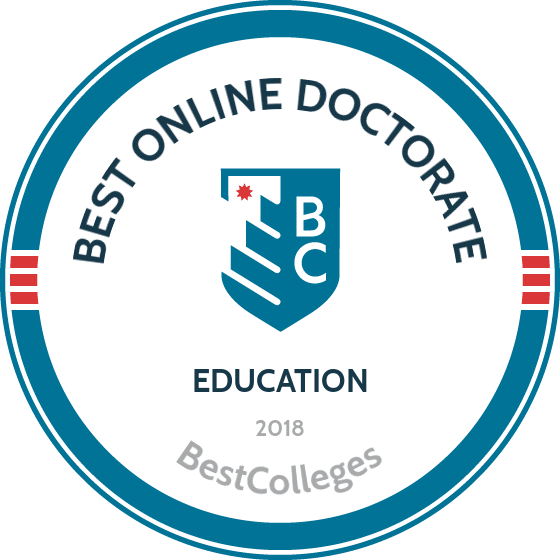 Learn more about earning a doctorate in education online and what kind of career opportunities you can look forward to with this comprehensive guide. Generally, students can choose from two types of doctoral degrees. A Ph.D. in education emphasizes research and education theory. This credential is typically aimed at those who plan to pursue careers in academia. This option usually requires at least five to six years of full-time study; most Ph.D. students must write and present a lengthy research paper (known as a dissertation) in order to graduate. A Doctor of Education (Ed.D. ), on the other hand, focuses on practical solutions to various challenges of modern education. The Ed.D. is a popular route among administrators, curriculum designers, and other educators working at the institutional level. The average Ed.D. program takes three years to complete; the dissertation is concentrated in practical solutions, and students must conduct extensive survey research at the institutional level. Based in North Carolina’s Blue Ridge Mountains, Appalachian State began as a teacher’s college in 1899. The Boone institution has since grown into the state’s sixth-largest university and offers an array of internet-based degrees, including an online PhD in education. ASU’s doctoral program in educational leadership is a hybrid program that readies working educators to assume advanced positions in schools. The university runs the program using a cohort model. Learners can select from concentrations in educational administration; higher education; reading and literacy; and expressive arts education, leadership, and inquiry. They can also opt to follow the general track. Distance learners typically earn their degrees in 3-5 years, depending on the number of courses they take each semester. Many credits require visits to Boone for face-to-face meetings. Each student must complete a total of 60 credits, including 36 credits in the degree core. Applicants should submit a current resume (with evidence of three or more years of relevant work experience), all academic transcripts, a letter of intent, four references, and GRE scores from the past five years. One of the largest public institutions of higher learning in the country, Arizona State University hosts a doctorate in education online that focuses on leadership and innovation. Aimed at teachers, principals, superintendents, and other educators in administrative roles, ASU’s 90-credit curriculum emphasizes research and systematic study. Students in the program join leader-scholar communities where they explore problems related to practice in preK-12 classrooms and learn about higher education management. ASU delivers coursework in 7.5-week sessions, and distance learners work largely asynchronously. However, the program does encourage collaboration and peer-to-peer interaction. Anyone who holds a bachelor’s and master’s degree can apply, regardless of their degree concentration, but they must work at a location where they can implement what they learn. Candidates must submit collegiate transcripts, three letters of recommendation, an academic writing sample, a personal statement, and a curriculum vitae. Ball State University was founded as the Indiana Normal School in 1917 and has continued to offer a strong teaching program ever since. Based in Muncie, the public institution hosts an online EdD in educational administration and supervision. The university designed this 90-credit program to meet Indiana’s guidelines for superintendent licensure. Classes meet asynchronously and participants have the ability to customize their education. Students make their way through a curriculum that emphasizes research, decision-making, and management courses. All learners also complete a 10-credit dissertation. Degree seekers declare two minors (15 credits each) or one cognate (24 credits), but these may be in any field. While the university has a generous transfer policy, students must earn at least 48 credits at Ball State. Distance learners can access many of the same services as on-campus students, including the library, writing center, tutoring, advising, and tech support. Online students can also apply for a limited number of assistantships to help offset the cost of tuition. Established to serve working adults and transfer students, City University of Seattle is a private, nonprofit institution that relies heavily on the internet to deliver its programming. CityU hosts a doctor of education online program that prepares future leaders to address administrative challenges. This 90-credit doctor of education in leadership program looks beyond the classroom for managerial techniques and features concentrations in organizational leadership and higher educational leadership. Students can also pursue specialized study in a variety of fields, including inspired teacher leadership, strategic innovation and decision making, adult education and online learning, nonprofit leadership, global leadership, and entrepreneurship. CityU delivers most programming in an asynchronous format to accommodate the schedules of full-time teachers. The university also offers two optional summer residencies. Distance learners join cohorts, which foster “communities of practice.” Ambitious students can complete their doctorate in as little as 2.5 years. The university lets students transfer in up to 12 graduate quarter credits. Clarkson College takes a unique approach to its doctorate in education program by using a healthcare focus. The Omaha-based college set up its curriculum to ready graduates for teaching, practicing, and researching in healthcare settings. The school’s doctor in healthcare education and leadership program emphasizes learning theory, analytics, curriculum development, transformational leadership, and applied research. Students can enroll on a part- or full-time basis. The 44-credit curriculum also covers health economics, finance, trends in modern healthcare, and entrepreneurship. Applicants to this program must have completed three credits of graduate-level statistics and three credits of master’s research. The program takes place largely online, and students must complete a dissertation. Degree seekers also carry out a service project. Candidates need a master’s degree, at least one year of work experience (preferably in a healthcare-related field), a GPA of 3.0 or higher in their graduate studies, an academic writing sample, and three professional letters of recommendation. Applicants must also submit to an interview. Located in Morristown, New Jersey, the College of Saint Elizabeth is a small, private, Catholic liberal arts school with a strong education program. The school offers a doctorate in educational leadership that runs online and on campus in parallel; students can move between cyber-based and brick-and-mortar classrooms on a weekly basis. The program runs in sequence across three years, and the university created the curriculum to address the needs of working educators. Saint Elizabeth also requires its students to commit to acting upon Catholic principles of servitude. Saint Elizabeth’s online EdD is a 52-credit program with several targeted outcomes. Graduates leave able to lead high-performing learning communities, apply research to systematically improve curricula, articulate the social purpose of education, and evaluate the role of servant leaders in society. Applicants must have a master’s degree from an accredited institution, a high level of professional experience, two letters of recommendation, and a letter of intent. The university charges a flat-rate tuition, regardless of a student’s residency. Colorado State University offers an array of internet-based degree programs from its campus in Fort Collins. These offerings include an online PhD in higher education that helps students develop their leadership potential, readying them for careers as academic administrators at all levels. In the 60-credit program, distance learners join a cohort where they enjoy continued support and networking opportunities as they progress through the curriculum. Participants must have at least two years of experience and most students earn their degrees within five years. CSU divides the curriculum of its doctor in human research studies with a specialization in higher education leadership program in half between asynchronous classwork in administrative subjects (e.g., educational law, finance, and leadership development) and research, dissertation, and juried presentation requirements. Degree candidates must pass comprehensive oral and written exams. Admission requires submission of a resume, proof of a master’s degree, three letters of recommendation, and GRE or GMAT scores if applicants have a GPA below 3.0. Part of the Georgia system of higher education, Columbus State University is a comprehensive school that offers more than 80 degree programs, many of them through its virtual campus. Students can pursue a doctorate in education online in a blended format. Individuals join a cohort and earn most of the required 63 credits online, working asynchronously; however, they must also visit the university’s campus in Columbus over the course of the three-year program. CSU developed its curriculum to help working teachers, administrators, and district personnel assume leadership positions. The program emphasizes educational psychology, pedagogy, assessment, and research. Columbus State’s doctorate in education in curriculum and leadership meets the approval of the Georgia Professional Standards Commission. The university’s admissions department requires students to submit all of their official academic transcripts, GRE scores, a resume, a professional statement, four references, and proof of a federal background check. Based in Baltimore, Johns Hopkins has operated for over 140 years, and is America's oldest research university. During that time, 36 Johns Hopkins faculty members have won Nobel Prizes. Today, the university's well-regarded online learning platform includes more than 45 free classes, which are open to anyone who wishes to enroll. Johns Hopkins' online Ed.D program covers new and emerging research perspectives. Specifically, the program focuses on how innovative technologies, research science, and the rise of for-profit education have changed the global educational landscape. JHU prepares students for leadership roles as educational practitioners, teaching advanced concepts in evidence-based principles that open doors to both domestic and international career opportunities. Distance learners must complete 30 credits, which are earned through seven classes and extensive research work. Courses cover multicultural education, contemporary approaches to educational problems, technology and creative learning, and much more. With a main campus in Saint Louis, Maryville University is a private, midsized school. The university began offering programming for working adults in the 1980s and has since established a popular virtual campus. It offers an online education doctorate that gives working educators a solid foundation in modern leadership strategies, research, and assessment, while also allowing them to create degree plans geared toward their interests. The school’s 48-credit doctor of education in higher education leadership program can be completed in fewer than three years by distance learners who enroll year-round. The cohort-based program is available entirely online. Students pursuing Maryville’s EdD degree work on their dissertation throughout the program, using it to stimulate their other classes. This degree emphasizes the importance of research strong leadership, implementing efficiencies, and inspiring others to learn. Students can attend both of the required residencies online. Applicants to the program must have a minimum of three years experience in higher education. Located on the coast of New Jersey, Monmouth University is a private, midsized school. The university’s online education doctoral program takes two years to complete and stresses innovation and reflection. The curriculum follows five strands: leadership and learning, transformative learning, policies and procedures, research and assessment, and a transformative-learning project. Monmouth hosts its 54-credit, cohort-based doctor of education in educational leadership degree through a hybrid program, requiring students to periodically visit its main campus in West Long Branch. Distance learners complete most coursework through the internet but must attend sessions on some Thursday nights and Saturdays. Degree candidates compile a professional portfolio as they work through the program, which they present in lieu of taking a comprehensive exam. At the end of the program, degree candidates must also defend their dissertations. Admission requires a master’s degree earned with a GPA of 3.25 or better, GRE or GMAT scores, two letters of recommendation, a personal statement, and an interview. Begun as a college for kindergarten teachers, Chicago’s National Louis University continues to educate teachers through its college of education. This private institution offers an online EdD program that grounds students in functional areas of higher education and allows them to complete their required residency through the internet. While most of the program is asynchronous, distance learners do need to attend some mandatory meetings by using video conferencing technology. The curriculum focuses on student-centered learning, research-based and data-driven decision making, and mission-oriented leadership. Full-time students can complete NLU’s 60-credit EdD in higher education leadership program in under three years. Degree candidates begin working on their required doctoral capstone project in their first year. The curriculum opens with two gateway courses, i.e., higher education in the United States and introduction to doctoral studies and research, before moving into nine classes that form the core. The university charges distance learners a flat-rate tuition. New Mexico State, founded in 1888 and based in Las Cruces, is the state's oldest public college. The university's distance education programs draw from a range of technologies, including advanced web-based virtual classroom platforms and interactive television, to promote student interaction and engagement with faculty. NMSU's online Ph.D program in curriculum and instruction requires students to take courses in the spring, summer, and fall. Applicants must hold a master's degree in education and have completed graduate-level coursework in curriculum development, multicultural education, technology and pedagogy, and pedagogical research. Applicants are encouraged to apply for even-numbered years. Students take courses in a structured, cohort sequence, and must sign up for two classes in the summer, spring, and fall terms. Distance learners must complete 48 credits to graduate, and each student is required to spend a small amount of time on-campus during summer sessions. With a main campus overlooking the Pacific Ocean in Malibu, California, Pepperdine is a nonprofit, Christian university affiliated with the Church of Christ. This Southern California institution delivers its doctor of education in educational leadership, administration, and policy (ELAP) as a 60/40 hybrid program. Students engage in face-to-face campus meetings five times a year and asynchronous and real-time internet-based work during the remaining months. Program participants also need to attend one residency, which is usually held in the District of Columbia. The university created this program to prepare educational leaders for work in classrooms, district and county sites, colleges and universities, and other advanced learning settings. Students enrolled in Pepperdine’s EdD program online typically join a cohort and spend their first two years working through the 51-unit curriculum. They then take a year or more to complete their dissertation; however, the university allows students to take up to eight years to earn their degrees. Applicants must submit academic transcripts, three professional recommendations, a proctored essay, and a personal statement. Saint Peter’s University is a Jesuit school located in Jersey City. This private institution established its EdD online program to prepare mid-career educational professionals for upper-level, administrative positions in academia and research. Students explore what makes leaders successful, looking reflectively at themselves and their organizations. The 48-credit, cohort-based curriculum focuses on the challenges facing modern education in teaching, learning, management, policy, and finance. A typical distance learner takes 2.5 years to complete their credit requirements, working asynchronously, and then another year finishing and defending their dissertation. At Saint Peter’s, students begin their dissertations shortly after entering the EdD in education program. Most professors deliver classes asynchronously, and the university is currently phasing out older hybrid elements. Students may transfer in up to nine transfer credits earned with a “B” or higher. Applicants must hold a master’s degree earned with a GPA of 3.0 or higher. They should also submit their GRE or GMAT scores, a personal essay, and a current resume. A private, independent university in Connecticut’s largest city, the University of Bridgeport has a popular digital campus. This New England institution hosts a dozen degree programs, including a doctorate in education online, which it offers through a hybrid program. The 62-credit doctor of educational leadership degree requires students to visit campus for two, one-week residencies. Most of the remaining coursework can be completed asynchronously online. Distance learners cover organizational psychology, law, program evaluation, and principles of management. Students also have the option to specialize in international education. Degree candidates need to maintain a 3.0 as they progress through the curriculum, and they must complete a dissertation and a comprehensive exam to earn a diploma. The university grants as many as six transfer credits. Admission requires a master’s degree earned with a 3.0 GPA or better, GRE or GMAT scores, two letters of recommendation, a personal statement, and a resume. The online EdD program at Denver’s University of Colorado has a fairly unique focus: educational equity. This 54-credit program challenges participants to think of ways to solve the educational disparities between suburban and inner-city schools. Aimed at professionals with more than five years of experience in schools, the curriculum features weekend and summer intensives on campus in Denver. During these intensives, students interact with other individuals in their cohort, building strong friendships and networks of support. The curriculum’s primary focus areas include equity, access, leadership, and learning. Coursework delves into theory, which individuals subsequently put into practice in their own schools. Distance learners must earn six credits in equity and diversity, 12 credits in leadership and learning, 12 credits in an area of interest, and 15 credits related to their dissertation and a comprehensive exam. Electives comprise the remainder of the coursework. The University of Florida is one of the nation’s biggest universities, and it also offers one of the largest selections of online degrees. The Gainesville institution confers more than 170 degrees and certificates through its digital classrooms, including two online doctoral programs in education. Both the doctorate in educational leadership and the doctorate in higher education administration programs follow blended or hybrid formats, requiring participants to visit northern Florida for as many as three weekend meetings per semester. In both of UF’s education doctoral programs, students join cohorts where they take classes with the same group of peers, earning a total of 90 credits. The university accepts as many as 15 transfer credits. Non-resident distance learners pay resident tuition, but slightly more in fees. Applicants must have a master’s degree (with a GPA of 3.0 or higher over their last 60 credits), acceptable GRE scores, and letters of recommendation. A private, Catholic university in the Benedictine tradition, the University of Mary offers an array of online degree programs to students of all faiths. These include a doctorate in education, which focuses on leadership at both the preK-12 and higher education levels. In addition to exploring the challenges and opportunities of modern pedagogical administration, the program also promotes Christian, Catholic, and Benedictine values of service, community, and respect. The university admits new, 16-member cohorts every two years. Graduates learn how to partner with fellow educators, parents, policy makers, and communities to provide safe and effective learning environments. UMary’s curriculum follows an accelerated format, and students typically earn their degrees in fewer than three years. Applicants must have a master’s from an accredited institution. They must also submit their GRE scores and complete a proctored writing sample and an interview. Distance learners pay a flat-rate tuition. One of two doctoral programs offered by the University of Wisconsin-La Crosse, the online EdD in student affairs administration and leadership is well-suited for working educators. The three-year course of study teaches professionals to be effective student advocates; develops educational innovators; encourages equity and diversity; and graduates ethical, people-focused leaders. Faculty deliver most of the 54-credit curriculum asynchronously. UW-La Crosse partners with other campuses in the University of Wisconsin system, giving students the opportunity to take shared courses with educators from other programs. This creates a larger network of colleagues and exposes distance learners to a wider variety of ideas and methodologies. Students must maintain a GPA of at least 3.0 and prepare and defend a dissertation that explores a challenge encountered during their professional career; individuals sometimes work on their thesis for several years. The university accepts up to nine qualifying transfer credits. From its main campus in Nashville, Tennessee, Vanderbilt University offers a range of graduate and doctoral programs, including a doctorate in education that specializes in organizational leadership and learning. This private university encourages both current and aspiring administrators to enroll in its 54-credit course of study. Key competency areas include leadership, organizational growth, learning and design, and data analytics. Students in Vanderbilt’s doctor of education online program attend most classes in virtual classrooms by using webcams, allowing learners to interact face-to-face with their peers and professors. Participants must convene once a year in Nashville for on-campus immersions where they engage in collaborative learning projects. At the end of their degree plan, distance learners complete a capstone experience where they defend their ideas in front of a faculty panel. The university charges a flat rate for online tuition. Applicants must have a master’s degree, professional work experience, a GPA of 3.0 or better, and superior verbal and math skills as demonstrated by their GRE or GMAT scores. West Virginia University, a research university located in the city of Morgantown, offers a doctoral degree in higher education administration that can be completed in a hybrid online/in-class format. The 87-credit EdD in higher education administration includes 15 credits of core courses, covering topics such as diversity issues, the history of higher education, and leadership and organization. Learners choose from one of four 12-credit specialization tracks, including curriculum, assessment, and academic affairs; college student development; administration, organization, and policy; and an individual studies track. They must also complete 15 credits of core research courses, 12 credits of courses in a cognate minor, an internship, and a dissertation. Program applicants must submit a personal VITA, three letters of reference, a goals statement, and may be interviewed by the higher education doctoral committee. Applicants must have earned a minimum GRE score of 300 in order to be considered. A private, Baptist school in Hattiesburg, Mississippi, William Carey University offers an affordable online doctorate in educational leadership that students can complete entirely online. Distance learners meet residency requirements by taking advantage of video conferencing tools. Built around a cohort model, the program requires distance learners to earn 63 credits in subjects that include conflict resolution, advocacy for the school and community, and professional writing. The curriculum emphasizes research and data analysis and concludes with an independent study field project. Cohorts begin each summer with students taking two, five-week classes during their first trimester. As they move deeper into the curriculum, degree candidates switch to longer 10-week terms to accommodate the depth of research required by more advanced classes. Students must maintain a GPA of 3.0 throughout the program. Applicants should have a master’s degree, valid teaching licenses, GRE or GMAT scores, two letters of reference, and a scholarly narrative. A leader in internet education, Wilmington University is a private, non-sectarian institution based in New Castle, Delaware. Known for providing academic opportunities to working adults and non-traditional learners, Wilmington serves more than 40% of its students through its internet classrooms. The university hosts two online doctoral programs in education, including one focused on higher education learning and innovation. The 57-credit curriculum of this program has earned recognition from the Educational Leaders Constituent Council. Applicants should have experience in educational or administrative positions. The curriculum advances sequentially, and students proceed through consecutive seven-week terms in a largely asynchronous fashion. Degree candidates engage in classroom-based learning and discussion and complete 120 hours of field experience where they research a problem in a higher-education setting. Once this experiential requirement is complete, they move on to complete a capstone course. WU charges distance learners a flat-rate tuition, regardless of a student’s residency. Deniece Dortch has a master's degree and a Ph.D. in education, and is happy to share her expertise as both faculty member and administrator in higher education. She has years of experience both advising and coaching students and perspective students about the graduate school process, and welcomes the opportunity to share her story. Why did you choose to earn a doctorate in education? Was this a field you were always interested in? I chose to get a doctorate because I originally wanted to be a chief diversity officer. I had a master’s degree and several years of experience as an academic practitioner and felt that a doctorate would not only advance my career but also place me in a position where I could begin to make institutional and systemic change. Why did you choose to earn a general doctorate as opposed to a more specialized degree (e.g., a doctorate in educational administration or learning and instruction)? I chose to obtain a Ph.D. as opposed to an Ed.D. because I wanted to understand and learn more about research. Further, the training that you receive when obtaining a Ph.D. prepares you to become a faculty member, while other degrees usually don’t. There are a few exceptions, such as an Ed.D. from Teachers College, Columbia University. Unfortunately, there is still an ongoing debate as to the value of a Ph.D. versus an Ed.D., with many folks favoring Ph.D.s due to their levels of rigor, research intensity beyond the writing of a dissertation, practice with teaching, drafting of literature reviews, policy memos, etc. What was the job search like after completing your degree? Did you feel fully prepared when making the transition from student to professional? The job search can be challenging for anyone who is on the job market. As I mentioned earlier, I was an administrator first who then became a scholar. I call myself a scholar-practitioner. Because of this, when I applied for administrative positions, other administrators had a hard time categorizing me and my CV. They would say things like, “You have so much research experience, I can see you being a researcher, a faculty member, or an administrator. Why do you want to be an administrator?" For me, I take that as a compliment. I want there to be clear distinctions on my CV that indicate that yes, I be in any one of these career fields. Being a scholar has made me a better practitioner, and because I am a practitioner, I am a better scholar. Having a Ph.D. helped me do that. When I was applying for jobs as a faculty member, I didn’t really get that question, but employers appreciated and welcomed my practical experience in the field, which has helped me to secure positions over the years. What are some of the challenges you face in your work on a day-to-day basis? As a faculty member who is also a woman of color, I am presumed incompetent when I walk into a room even if I was asked to be there. This challenge is a result of systemic racism and is no different than for any other young-looking person of color who teaches in spaces where students are not accustomed to people of color leading their classrooms. Further, my research largely addresses academic violence and the ways that institutions can combat it. This is a challenge for many to wrap their heads around, despite all of the research that exists recognizing how racial violence, racial trauma, gaslighting, and racial battle fatigue impact students of color and faculty of color in ways that hinder their progress and success within academia. How did your experience as a faculty member inform your experience as an administrator in higher education (or vice-versa)? When I was an administrator, students treated me very differently; they considered my time to be their time. I would often find them in my office without an appointment, and they came to me much more often (several times a day) with their problems and issues. When I was an administrator, I think I had fewer boundaries. Now, as a faculty member, I have required that students in my classes come and see me during office hours as part of their grade. While they are in my office, they are allowed to discuss whatever they want (television shows, what they did over the weekend, class assignments, etc.). By doing this, I believe that it humanizes me to students in way that just being in front of them in class does not, and students are less likely to ask for help when it is too late for me to give it. What advice would you give to students who are considering a doctoral degree in education? For all students considering a doctorate, I would tell them to make sure that you are able to give it the time and attention it needs. Make sure that you NEED to get a doctorate to do the work that you want to do. I am all for life-long learning and cultivating an inquiry-driven learner, but getting a doctorate is expensive and time-consuming. The process challenges who you are and what contribution you are going to make to your field. Choose an institution, a program, and faculty who are going to support YOU and your process. Also, choose a program that is going to adequately fund you. Sometimes, the schools with the best funding are in places that you might find to be undesirable. Are you willing to live in that place 4-6 years? And yes, location does matter. Think about your own need for community and belonging. Lastly, ask the faculty at the prospective institutions about the types of jobs that students have been able to secure upon graduating. Make sure that you put yourself in a position where that institution is able to supply you with the types of opportunities that you will need to compete with those folks who are going to be in your field when you are finished. Does everyone have teaching experience? Have they all been on research teams? Have they published prior to graduating? Have they secured grant funding? How often are students publishing on their own or with their advisors? Are they funded to travel to conferences to present their work? What types of jobs do students have while going to school? Is it a program where you can maintain full-time employment? Many students who leave their professional positions to become full-time students lose years of professional experience to then become graduate students or research assistants doing similar work for pennies on the dollar while completing their degrees. Is this something that you are willing to do for the next 4-6 years? I keep saying 4-6 years, but in truth, the national average is eight years to complete a doctorate. If you are wondering, I finished mine in three years. Sound impressive? It isn’t when you add the years it took for me to obtain two master's degrees. Will an Online Doctorate in Education Program Help Develop the Skills I Need to Advance My Career? Online doctorate in education recipients are armed with the skills and knowledge to enact meaningful changes in today’s schools and classrooms. The Ph.D. track will introduce students to the most popular theories and philosophies guiding today’s education system, while the Ed.D. will examine ways to solve current problems using established, best-practice strategies and resources. Will an Online Doctorate in Education Work with My Schedule? Online doctorate programs are designed to be a flexible alternative to a brick-and-mortar education. Students are able to access course lectures and readings, submit assignments, participate in online discussions with their fellow students, take exams, and communicate with their professor online. Current technology also enables them to study on the go using a laptop, tablet, smartphone, or another device with Wi-Fi capabilities. For added convenience, online students can often arrange practicum courses and other onsite requirements at locations within a reasonable distance of their current residence. What Jobs Can I Get with My Doctorate in Education? Opportunities for students who obtain a doctorate in education will largely depend on their degree type. Those with a Ph.D. in education will be qualified for jobs in academic research and education theory and are often employed by postsecondary institutions. Job availability for students with an Ed.D. will largely depend on their area of specialization. Popular specialization choices at the Ed.D. level include educational administration, curriculum and instruction, and special education. Common job titles for doctorate in education degree-holders include head teachers, professors, principals and vice principals, school administrators, curriculum developers, and education researchers. While programs vary, students in online Ed.D. programs can expect to earn their degree in three to four years, depending on whether they pursue the degree on a full-time or part-time basis. Applicants should examine each program carefully to ensure they meet admission guidelines and that the curriculum offers the skills and competencies necessary for career advancement in their state. The following breaks down what learners can expect as they pursue an online doctorate in education. Most doctorate in education programs, regardless of whether they're online or on campus, require that applicants hold a master's in education with a minimum 3.0 GPA. Some schools allow applicants with a master’s degree in another field to complete a certain number of additional master-level courses to meet the requirements of an M.Ed. Applicants should also submit acceptable scores on a standardized test, most notably the GRE or MAT. Some programs require that applicants have at least three years of experience in education, which may include areas such as teaching, administration, instructional design, or direct services. Even if the school does not require education work experience, admission committees often take such experience into consideration as they evaluate each application. As learners decide which specific education path, the concentrations offered should serve as a key factor for students who plan to specialize in a particular area. The specializations may address education focus areas such as school leadership, curriculum planning, or research. The following three concentrations are offered by many programs. This concentration prepares administrators for leadership roles at postsecondary institutions. The curriculum focuses on topics such as program evaluation, governance in higher education, higher education law, and postsecondary student populations. This concentration prepares educators to provide evidence-based education and services to students with disabilities and those at risk. The curriculum focuses on topics such as learners and learning, designing interventions, and measuring outcomes. The curriculum for this concentration focuses on topics such as motivating others, instructional design, assessment and evaluation, and research design and data analysis. This course prepares learners to engage in inquiry through intensive research that requires the collection and analysis of data to solve complex problems in education. It also builds students' research skills in preparation for the dissertation process. The course paves the way for roles as researchers and practitioner-scholars. This course trains educators able to develop curriculum informed by best practices and research, with a specialized focus in areas like elementary, secondary, or special education. Learners assume roles such as curriculum specialists, instructional supervisors, or school administrators. This course prepares educators who can create well-aligned curriculum, instruction, and assessments; develop plans for professional development; use data to improve student performance; and lead teachers within their schools or districts. Educators receive training for administrative careers such as principalships. Learners engage in coursework and field-based experiences that connect theory with practice to develop highly competent school leaders able to transform schools and foster student success. The course prepares educators for administrative careers such as principalships and central office personnel. Students engage in a critical examination of education research as they learn to apply quantitative and qualitative theories, methods, and data analysis in their own research design projects. Educators acquire skills necessary to develop and evaluate educational programs at the school and district levels. Research: Through coursework and the dissertation process required at the doctoral level, students engage in intensive research that hones their research methodology and prepares them for roles as researchers, faculty, and practitioner-scholars. Leadership: Students acquire the leadership skills necessary for careers as highly skilled teachers and administrators able to deal with the unique challenges facing all levels of education. Evidence-based Practice: Through their exposure to the latest research and subject matter experts, learners acquire knowledge of best practices that inform the development of solutions to enhance student learning and leadership skills for educational organizations. Instructional Technology Integration: Some online doctorate in education programs offer a major in instructional technology that teaches learners to integrate technology in instructional design and learning assessments in school districts, colleges, or businesses. Written and Oral Communication: Students gain advanced written communication skills to organize and communicate complex data and concepts in a dissertation, which they will need to orally defend in front of a committee. In addition to the dissertation component, many programs require that learners complete a capstone project that synthesizes what they have learned in the program and applies it to real-world contexts. During an internship or practicum, faculty may also require learners to apply concepts and best practices learned in the classroom in their own place of employment. Many doctoral programs do not require this component; instead, they mandate residencies or intensives that may include an orientation at the beginning of the program to introduce learners to their peers and faculty. How Long Does It Take to Get a Ph.D. in Education Online? Most online Ed.D. programs require at least 48 credits for graduation, though requirements vary depending on the program. Students completing the degree on a full-time basis can expect to do so in 3.5 years, while those enrolled part-time can do so in five or six. As students begin to develop their list of doctoral programs in education, they should consider whether programs require cohort or self-paced learning. Students in a cohort begin and complete the program together, leaving very little room for scheduling flexibility. Alternatively, self-paced programs offer more flexibility, as students can take classes and complete assignments within a given timeframe. Students must also complete a dissertation in addition to the program's curriculum. The dissertation involves many levels, including choosing a research topic, participating in a mentorship with a faculty chair and dissertation committee, and completing research and data analysis. Many learners pursuing online Ed.D. programs in higher education already hold teacher or administrator certification. In almost all states, educators must pass a standardized test for teacher or administrator certification, and the requirements vary from state to state. Most certifications require at least a baccalaureate degree, certain coursework, the Praxis series or similar tests, and student teaching. Many teachers pursue the National Board of Professional Teaching Standards certification, which stands as the most respected K-12 professional certification. The NBPTS certification enhances an educators' job prospects by showing that they meet high standards of practice and effectiveness in the classroom. Accreditation is a critical factor prospective students should consider as they review a list of the nation's best online Ed.D. programs. Colleges hold either national or regional accreditation, which is acquired through a rigorous process that involves site visits and a review process from accrediting agencies. Institutional accreditation ensures schools and their programs maintain high academic standards and meet established accountability expectations. Regional accreditation serves as the gold standard, conferred by agencies such as the Higher Learning Commission, New England Commission of Higher Education, and Southern Association of Colleges and Schools Commission on Colleges. Many of the doctoral programs in education may also hold programmatic accreditation from the Council for the Accreditation of Educator Preparation. Accreditation not only ensures high standards, it factors in practical matters such as the transferability of credits from the master's degree. Accredited programs generally do not accept credits from programs without accreditation. Furthermore, financing the degree may pose a challenge since students can only access federal loans and grants if they plan to attend accredited colleges. The issue of accreditation remains so important that even accrediting agencies must withstand scrutiny from the U.S. Department of Education (ED) and the Council for Higher Education Accreditation (CHEA). Students can find a list of accredited schools and online Ed.D. programs on the ED website and CHEA websites. Due to their high level of education, doctoral degree-holders typically enjoy very strong job outlook. According to data from the Federal Reserve Bank of St. Louis, individuals in the U.S. with a doctorate enjoyed an unemployment rate of 1.8% in August 2018. In addition to strong employment rates, jobs in professional education are expected to grow by a significant margin in the years to come. Using data from the Bureau of Labor Statistics (BLS), the following table features job growth projections (2016-2026) for some of the most common career pathways in the education field. As the table indicates, these five occupations alone are expected to grow by more than 32,000 new jobs between 2016 and 2026. Salary expectations for employees with a doctorate in education will largely depend on their specific job title, as well as other factors like school size, city/state of employment, and degree specialization. The table below looks at career salary growth projections for five popular career paths among doctorate in education degree holders. Of the five occupations listed on the table, the average rate of career growth was 43% between the entry-level and late-career stages. Curriculum developers experienced the highest growth: a 65% increase after 20 years on the job. Special education teachers placed second with 50% growth, followed by elementary school teachers with 43% growth. Depending on their specialization and degree type, students who earn a doctorate in education may find work at the elementary, secondary, or postsecondary level. Four potential career paths for these candidates are highlighted below. Principals manage the day-to-day operations at elementary, middle, and high schools across the country; they are found at both public and private institutions. Their duties include administrative management, budgeting and finance, student discipline, teacher evaluation, and curriculum approval. They also work closely with superintendents and other district-level officials. Many principals begin their careers as teachers and advance in title after earning a graduate degree; all 50 states and the District of Columbia require principals to be licensed. Postsecondary administrator is an umbrella term that applies to a wide range of teachers, faculty members, and other personnel at colleges and universities. Individual job titles include deans, registrars, student administrators, admissions officers, and faculty researchers. A Ph.D., Ed.D., or other doctoral credential is usually required for all of these positions. Instructional coordinators develop, evaluate, and implement standardized curricula at all grade levels. They work with teachers to ensure students are actively learning and engaged with their study materials and performing up to par with state standards. In some states, instructional coordinators must be licensed. Commonly referred to as professors, postsecondary teachers lead courses at two- and four-year colleges and universities. Depending on the subject they teach, professors may specialize in classroom lectures or focus more on small-group studies and hands-on instruction. A doctoral degree is often required for postsecondary teaching positions. Making professional connections and learning about different educational approaches is crucial to your success. Professional organizations offer a great entry point for students who want to learn more about their chosen career path. Below, you’ll find three of the country’s most prominent organizations for educational leadership professionals. These organizations host networking events, provide online training, maintain active job boards, and offer other services for career-ready college graduates. Resources like these often prove invaluable as you complete your degree requirements and prepare to enter the job market. Working to improve public education from preschool to graduate-level studies, the NEA provides resources on current regulations, strategies for securing financial support, and tools for creating high-quality lesson plans. Membership opportunities are available for working employees, retired professionals, and students. This nonunion organization seeks to create tools and resources that increase student achievement and positive classroom outcomes. The AAE currently represents more than three million members at different grade levels in all 50 states. The NASSP is represented by principals, assistant principals, and other middle and high school administrative personnel in 35 different countries. The organization hosts networking functions, offers continuing education programs, and gives members the opportunity to become advocates in different key areas of secondary school administration. Despite the relative affordability of online programs, most students still need financial assistance. Students should complete a Free Application for Federal Student Aid (FAFSA) form to learn more about loans, grants, and other opportunities offered through the U.S. government. Additionally, private grants and scholarships are available through nonprofit organizations, companies, and other sources. Check out our collection of resources below to learn more about financial aid options. Our list of scholarships and grants specifically aimed at education majors includes 43 individual rewards totaling more than $170,000 in financial aid. Browse our database to learn more about accessing free money to pay for your online teaching master's degree. BestColleges.com does not have the data to accurately assess the relative quality of these online doctorate degree programs. For this reason, we've provided an alphabetical listing of schools that offer an online Doctorate in Education.